Coastal erosion was widespread during the 20th Century and is expected to accelerate and become even more pervasive through the 21st Century due to sea-level rise and climate change. Erosion is a direct hazard for coastal residents and it also makes it more likely that natural and artificial defences will fail during storms, increasing the risk of coastal flooding. The risk of tidal flooding is widespread along open coasts and especially in estuaries, where extreme water levels are partly controlled by interactions between tide, surge and morphology and there are extensive flood plains. We can predict erosion and flooding during a specified extreme storm with some skill, but as we look further into the future, our ability to predict possible changes in risk diminishes. Much of this difficulty stems from our inability to quantitatively predict coastal and estuarine morphological changes over time scales of decades to centuries (the mesoscale). The NERC-funded iCOASST (integrating COAstal Sediment SysTems) project comprises a consortium of UK Universities, Research Laboratories and Engineering Consultants. The Environment Agency are an embedded partner who actively supported the development of the project and its application throughout the project life. Collectively, they are considering how best to address this challenge and predict coastal morphological change at the mesoscale to inform shoreline management, strategy studies and other long-term coastal decision-making. As we have already noted, this is a difficult problem, not least because the erosion and/or accretion of a coastal landform such as a beach is influenced by interaction with adjacent coastal landforms, be they cliffs, saltmarshes, tidal deltas, etc. The problem is further complicated by the role of soft and hard human interventions, which also exert a pervasive control on coastal evolution. A new Coastal and Estuarine System Mapping (CESM) framework, supported by a GIS-based software tool (CESMapper), for describing and mapping the interactions between coast, estuary and inner shelf landforms and the extent to which these are constrained by human interventions. CESM provides a basis for developing a shared understanding between scientists, stakeholders and policy makers concerning the most important processes, sediment pathways and human interventions that govern landform behaviour. Well-validated hydrodynamic and sediment transport shelf models, applied at the scale of UK territorial waters, to calculate currents, waves and net sediment movement for representative years. These model outputs define broad-scale sediment pathways and identify locations where there is likely to be active inner shelf-coast interaction in terms of sediment exchange. 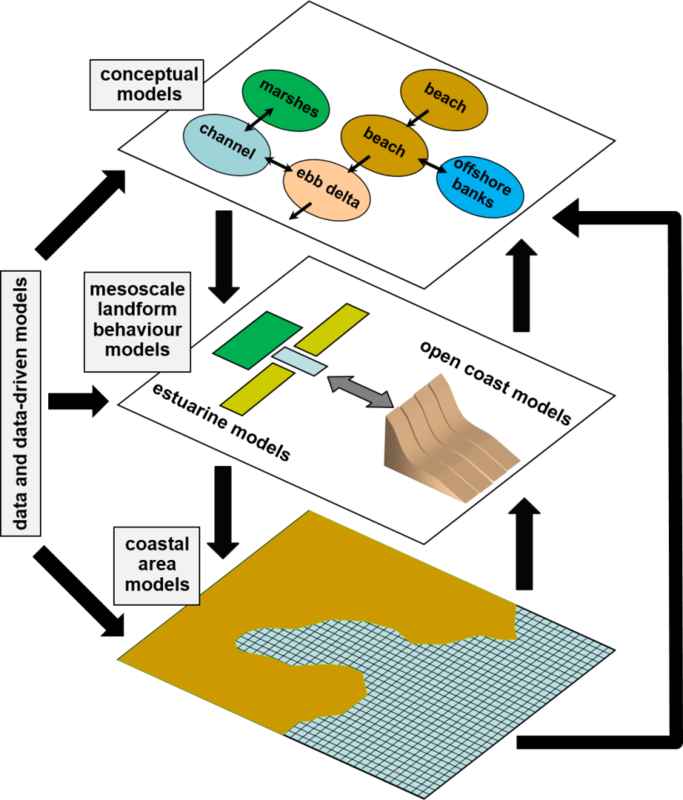 New and improved landform behaviour models for open coasts (SCAPE+), inlets (MESO_i) and estuaries (ESTEEM) that are appropriate for mesoscale simulations and are linked to coastal state indicators of importance to stakeholders. Groups, or 'compositions', of coupled coastal and estuarine landform models, informed by CESM outputs, which exchange information as they run. Linking models in runtime is a difficult task that has hardly ever been achieved before now for quantitative predictions of coastal morphological change. The iCOASST project is using the Open Model Interface (or OpenMI) standard for this purpose. As a proof of concept, we are also demonstrating an alternative way of linking models at the conceptual stage (CoastalME). Data are also fundamental to the validation and effective application of models. Coastal monitoring data are increasingly available in the public domain (e.g. at http://www.channelcoast.org) and this is stimulating the development of a new generation of models and data-driven analyses. The iCOASST project framework links these components to achieve a system-level understanding of coastal change. The ultimate goal is multiple simulations of coastal evolution to explore sensitivity and uncertainties in future decadal-scale coastal response, including the effects of climate change and management choices. The project is developing demonstration case studies in Liverpool Bay and on the Suffolk coast, including an active and ongoing engagement with local stakeholders to explore the realism and utility of our results. This has identified the importance of defining appropriate coastal state indicators and other results that link to activities such as shoreline management planning. iCOASST is also taking a participatory modelling approach, which includes all interested stakeholders, including the public. Stakeholders bring valuable knowledge and contribute to structuring the problem and the formulation of an agreed modelling approach, rather than merely being 'consulted' on simplified outputs from a modelling process led purely by 'experts'. Guidance on mesoscale model selection, applicability, strengths and weaknesses, benefits over existing approaches in shoreline management planning and coastal / estuarine strategy studies. The coastal modelling community who want a user guide on how to run the models and generate outputs. Box 1. Illustration of how participatory events supported the development of the Suffolk composition. Discussions with stakeholders during early stages informed the coastal systems mapping and the conceptualisation of the composition and its elements. The next interaction occurred during calibration and validation, when composition outputs were tested against local knowledge and experience. As demonstrated by the many linkages in this figure, this approach allows knowledge gained from stakeholders at later stages of the process to cascade back to the geomorphic interpretation underpinning the modelling process. As Hall et al. (2014) observe, it is important to achieve some fusion of scientific and lay conceptualisations as to how the world works. The CESM approach is intended, at least in part, to engage with this challenge. It has the advantage of rendering the complexity of coastal and estuarine geomorphological systems as a fairly simple ontology of components and interactions, and depicting these in a visual form (as system maps) to provide a highly effective catalyst for discussion and debate between scientist, stakeholder agencies and organisations, and local citizens (Figure 1). Figure 1. Stakeholder meeting in Woodbridge, Suffolk. Within the iCOASST project, the system maps have been enthusiastically received by a diverse group of stakeholders that includes, inter alia, management agencies and regional authorities, non-governmental organisations, representatives of industry and agriculture, and local inhabitants. In the case of the Suffolk study region, discussions have centred on matters of detail, such as the omission of local geological controls on shoreline position, as well as broader scale divergences in opinion - notably concerning the consistency of the direction of littoral drift (see also French and Burningham, 2015). As a result we revaluated and reformulated our quantitative understanding on the Suffolk coasts. Hence, these discussions have been valuable in capturing stakeholder knowledge and feeding this into both data-driven analyses (Burningham and French, 2017) and modelling studies. The capturing of local knowledge and its incorporation into the formulation of a problem and an approach to it, are key elements of good modelling practice that have all too often been neglected in coastal analysis. Importantly, CESM is transparent and accessible to a wide range of users. This is partly a consequence of its implementation in open-source software. This counters one of the major shortcomings of a 'top down' approach to shoreline management planning that has historically been heavily reliant on proprietary closed-source model codes and GIS software that is available to the larger consultancies but not to local communities and smaller consultants. As French et al (2016b) note, the open source paradigm of computer science is a good exemplar here, in that it demonstrates the benefits of a genuine community effort, both in terms of transparency and accessibility and also in terms of legacy. CESM has the potential to create conceptual models that are living community efforts, stimulating a greater sense of shared endeavour between modellers and stakeholders than has thus far been possible. These conceptual models and linked databases are free to evolve beyond individual project timelines through the continuing involvement of a community of researchers and stakeholders. Hence, the system maps constitute information products that are not finalised at a project end date but, instead, remain free to evolve as knowledge accumulates and agendas change over time. We have also brought a participatory approach to bear on the development and application of quantitative models of mesoscale coastal morphological change. Following Voinov and Bousquet (2010), this has involved building our models within the shared conceptualisation achieved using CESM, and iteratively refining model approach, capabilities and application scenarios to take account of stakeholder views. A particularly useful lesson from stakeholders in both the Liverpool Bay and Suffolk regions has been the importance of establishing the linkages between new models and existing tools used by consultants. Only rarely do new models emerge that completely replace existing capability and consultants have a heavy investment in a wide range of existing software tools for coastal morphological change and erosion/flood risk assessment. Accordingly, development of our new ESTEEM estuary simulator has included experimental work to define workflows for its co-deployment with proven hydrodynamic codes (such as Telemac) to allow its use to enhance rather than wholly replace existing approaches to flood risk assessment. Stakeholder opinion has also been extremely valuable in guiding model output capabilities, including time and space resolution and visualisation of results. 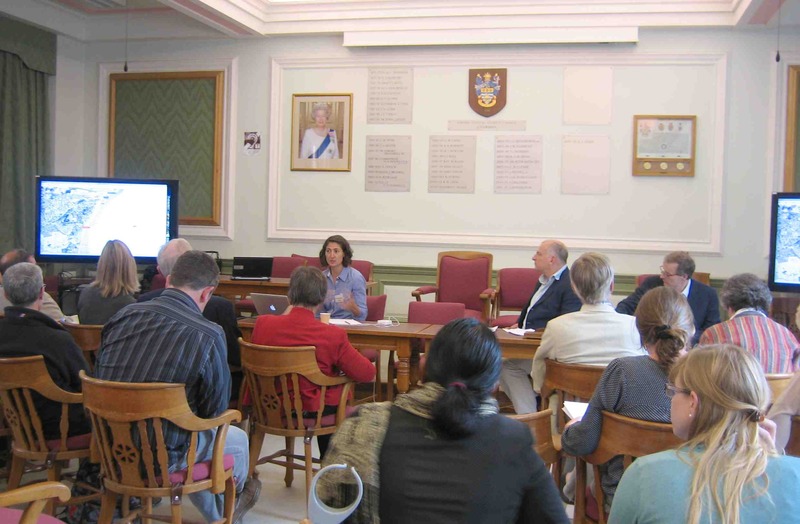 As part of the Participatory Modelling approach, considerable effort was invested in understanding stakeholder concerns and questions and communicating the model results, particularly through visualisations. Visualising the model results is challenging both for the modellers and for the stakeholders. As we had multiple stakeholder meetings in Suffolk, we were able to give considerable attention to this aspect, and an iterative approach was followed which allowed complex results to be more effectively communicated. Key to the success of this communication was the visual representation of model outputs of the Suffolk composition at an appropriate level of abstraction. The three models comprising the composition represent physical processes at a range of levels of abstraction. ESTEEM is capable of spatially explicit descriptions at high resolution. MESO_i, in contrast, simply deals with notional volumes of material, which are related through exchange of sediment, but are not located spatially. In contrast the SCAPE+ models are spatially explicit, whilst conceptually abstract. A hybrid visualisation was developed to represent the output and interactions of these models in a manner that was readily comprehensible. MESO_i elements were simply represented with coloured ovals, the areas of which were proportional to element volume. Approximate spatial coordinates were assigned in each case. The same approach was used to represent the tidal prism calculated by ESTEEM. The SCAPE+ model outputs were pared down to two contours, one from the beach, and one from the consolidated profile behind/ below it. These were extracted from the models as spatially explicit information, but (for simplicity) represented only an impression of the full output of the models. An image of such an abstract and idealised visualisation is shown in Figure 2. Figure 2. Representation of some of the dynamic elements captured within the Suffolk composition. French, J.R., Burningham, H. 2015. Wave-driven sediment pathways on a gravel-dominated coast subject to a strongly bi-modal wave climate. In: Wang, P., Rosati, J.D., Cheng, J. (Eds.) Proceedings Coastal Sediments 2015, World Scientific, New Jersey, 15pp. French, J.R., Burningham, H., Thornhill, G., Nicholls, R.J. 2016b. Integrating estuarine, coastal and inner shelf sediment systems in a common conceptual framework as a basis for participatory shoreline management. In: Meadows, M., Lin, J-C. (Eds. ), Geomorphology and society. Singapore, Springer, 245-277. Gray, S.R.J., Gagnon, A.S., Gray, S.A., O'Dwyer, B., O'Mahony, C., Muir, D., Devoy, R.J.N., Falaleeva, M., Gault, J.2014. Are coastal managers detecting the problems? Assessing stakeholder perception of climatic vulnerability using Fuzzy Cognitive Mapping. Ocean & Coastal Management 94, 74-89. Hall, D.M., Lazarus, E.D., Swannack, T.M., 2014. Strategies for communicating systems models. Environmental Modelling & Software 55, 70-76. Nicholls, R.J., Dawson, R.J., Day, S.A. (Eds.) 2015. Broad scale coastal simulation: New techniques to understand and manage shorelines in the Third Millennium. Dordrecht, Springer, 398pp. Sano, M., Richards, R., Medina, R., 2014. A participatory approach for system conceptualization and analysis. Environmental Modeling & Software 54, 142-152. Voinov, A., Bousquet, F., 2010. Modelling with stakeholders. Environmental Modelling & Software 25, 1268-1281. Voinov, A., Gaddis, E.B., 2008. Lessons from successful participatory watershed modelling: a perspective from modelling practitioners. Ecological Modeling 197-207. The iCOASST Project made extensive use of a range of datasets as will be explained on this web page. We gratefully acknowledge all those who provided the data. In particular, the help and support of the Environment Agency as our embedded stakeholder is acknowledged. This guidance is presently being developed by HR Wallingford in collaboration with the iCOASST consortium, with funding from the Environment Agency. Luxford, F., Stansby, P.K., Rogers, B.D. 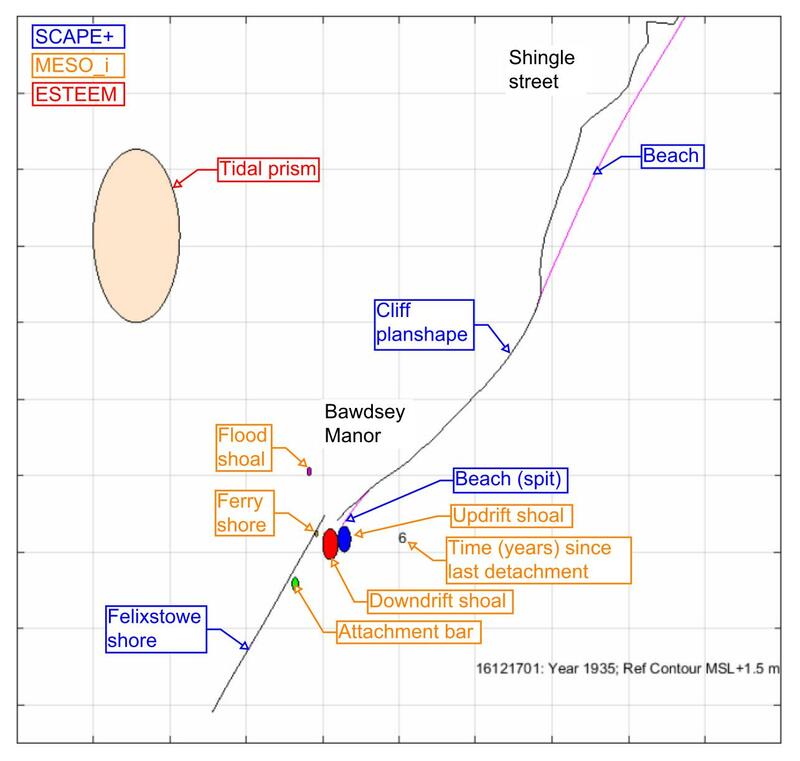 (2014) Accuracy of tidal modelling in Liverpool Bay with TELEMAC2D. Proceedings of the 21st TELEMAC-MASCARET User Conference. Van Maanen, B. Walkden, M., Barnes, J., Nicholls, R.J., (2016) Modelling the long-term morphological evolution of a coupled open coast, inlet and estuary system to explore climate change impacts. EGU General Assembly 2016, 17-22 April, 2016, Vienna, p.16410. Nicholls, R.J. (2016) Understanding and Predicting Decadal Coastal Evolution. EGU General Assembly 2016, 17-22 April, 2016, Vienna, p.5199..
Karunarathna, H., Mase, H. Baba, Y. (2015) Analysis of multi-scale beach change, 36th IAHR Congress, Hague, The Netherlands. Karunarathna, H., Horrillo-Caraballo, J.M., Kuriyama, Y. Mase, H., Ranasinghe, R. Reeve, D.E. (2016) Linkages between sediment composition, wave climate and beach profile variability at multiple timescales, Marine Geology, 381, 194-208. Horrillo-Caraballo, J.M., Karunarathna, H., Pan, S., Reeve, D.E. Performance of a data-driven technique to changes in wave height and its effect over beach response. Water Science and Engineering 9(1), 42-51. doi:10.1016/j.wse.2016.02.006. Karunarathna, H., Reeve, D.E. Mase, H., Kuriyama, Y., Ranasinghe, R. (2016) Linkages between sediment composition, wave climate and beach profile variability, 20th IAHR-IPD Conference, Colombo, Sri Lanka.